Following the confirmation of a cholera outbreak in the Artibonite region of Haiti, MSF medical teams are treating patients with symptoms of cholera in the city of Saint Marc. 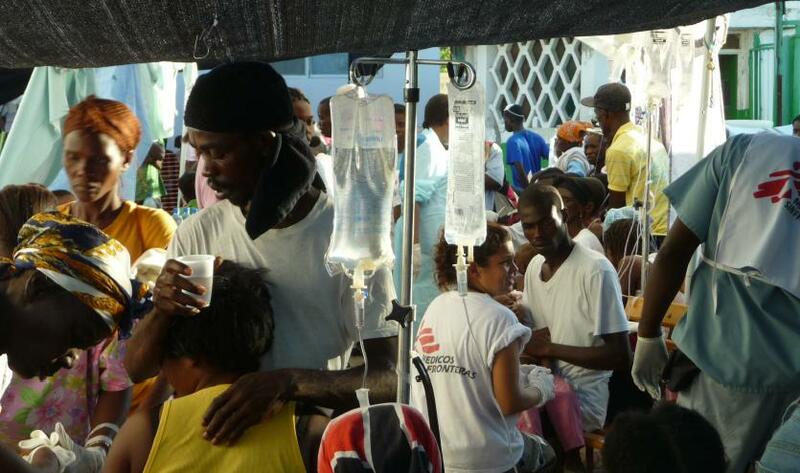 "There are significant numbers of patients in St. Nicholas Hospital in St. Marc, which does not have the capacity to handle a cholera emergency,” said Federica Nogarotto, MSF emergency coordinator in St. Marc. “The most important thing is to isolate the cholera patients there from the rest of the patients, in order to best treat those people who are infected and to prevent further spread of the disease. This will also enable the hospital to run as normally as possible. We are setting up a separate, isolated cholera treatment centre now." MSF has 20 staff, including doctors, nurses, logistical specialists, supporting the St. Nicholas Hospital. They are isolating the sick from the rest of patients already admitted to the hospital before the outbreak. Patients are given an oral rehydration solution (ORS) to replace fluids lost from diarrhoea and vomiting symptoms of a cholera infection. Patients too sick to drink the ORS are given infusions intravenously. Isolating suspected cases, hygiene promotion through education and provision of soap, and distribution of safe drinking water are key elements to prevent further transmission of cholera. Cholera is an acute intestinal infection caused by bacteria carried in human faeces and can be transmitted by water, some foodstuffs and, more rarely, from person to person. The main symptoms are watery diarrhoea and vomiting, which lead to severe dehydration and rapid death if not treated promptly. According to the World Health Organization (WHO), there are an estimated 3 – 5 million cholera cases and 100,000 – 120,000 deaths due to cholera every year in the world. MSF has responded to cholera outbreaks this year in Cameroon, Chad, Niger, Nigeria, Pakistan, Papua New Guinea, and Zambia. In Haiti, MSF has more than 3,000 Haitian and international medical and non-medical staff providing assistance to the population. They run seven private, free of charge, secondary-level care hospitals and support two Ministry of Health structures in Port-au-Prince, accounting for nearly 1,000 hospital beds in the capital city. These facilities provide emergency, trauma, obstetrical, paediatric, maternal, and orthopedic care services. Mental health care and treatment and counselling for victims of sexual violence are also provided by MSF. Outside the capital, MSF supports Ministry of Health hospitals in the cities of Leogane and Jacmel with nearly 200 beds of patient capacity. MSF opened a private 120-bed container hospital in Leogane in October.